Sometimes a blog post does not come easily. So let me just tell you how it is. I am drinking Camomile Honey and Vanilla Tea as I look for words to begin and thinking how much I love honey. Sourdough bread is in the oven. Fresh bread is one of my favourite things. And I look at my notes and remember what a fun day we had in the school holidays when I made this stew. 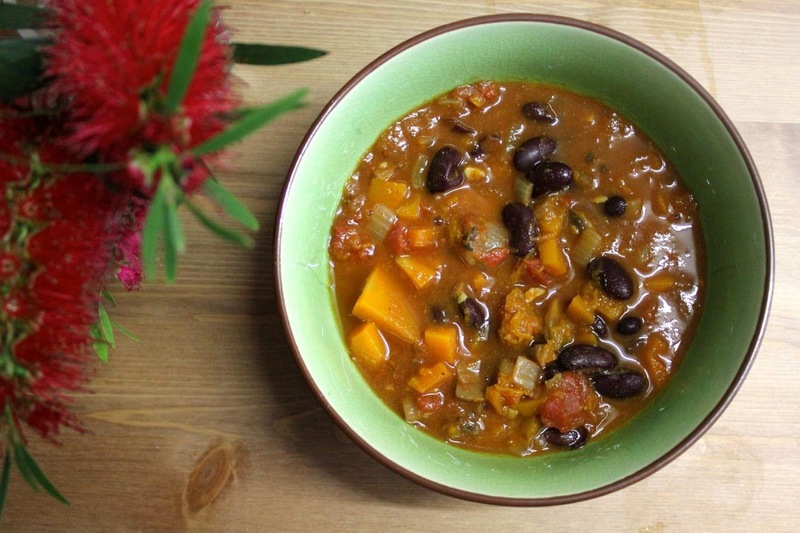 A stew filled with happy memories deserves a place on the blog. The day didn't begin well. Sylvia rose at 6am and put on the Frozen CD. Nooooooo! We went swimming. Yessssssss! We met Sylvia's school friend and her little sister at the pool. They joined us and a couple of other little kids that we know who were taking lessons. It was a fun time splashing about. I was complimented by an old lady on 'how wonderful you young mums are taking the kids to the pool'. ('Moi?') Followed by lunch at Zaatar where Sylvia actually now eats the zaatar pizza with not too much scraping off the zaatar. Then a play in the park where the kids had fun scrambling up a tree and watching the ducks. Later I felt good about my little victories. I finally sold our Ikea Trofast wardrobe (sob - I did love it but there is no room) after discussions with 3 potential buyers and 3 cancelled pick-ups. I sewed up a coat pocket that was torn in an anxious moment! I bravely fished out a 'black hissing thing' from under the coffee table (it was a piece of lego, Sylvia!). I sorted the collar on the cat who had managed to lose her old collar and slip out of her new one. I even used up lots of vegies from the farmers market in the stew. In looking at the recipe it seems a lot of stock powder. You might need to reduce to taste. I found that it needed quite a bit of seasoning. However I think this is the reason I added honey. Vegans could add other sweeteners to taste but I found that a little honey went a long way. 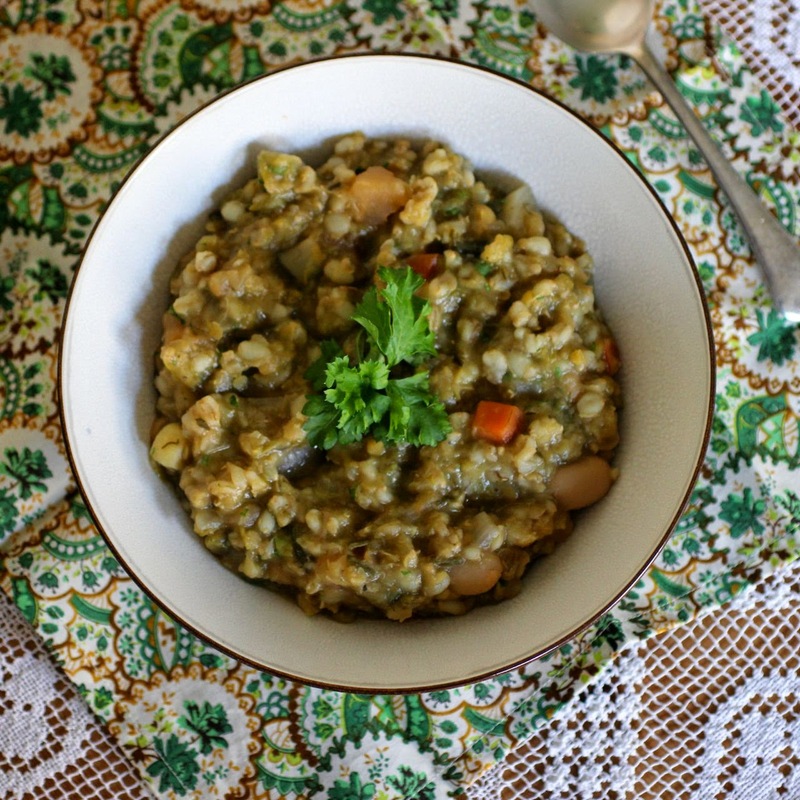 Barley made the stew very thick but it was packed with plenty of vegies that add flavour and nutrition. 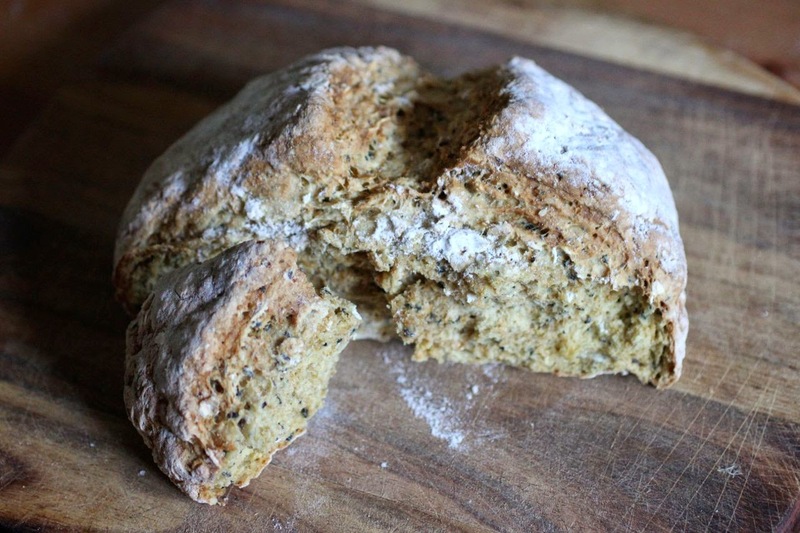 The stew was even better for being served with a hunk of fresh seeded soda bread. I was not sure it was quite cooked in the middle but even so it was a treat. I had the bread ready for Sylvia's dinner but the stew took longer. I waited until she was in bed and ate it listening to the Wonderland soundtrack. Good music and a sleeping child are every bit as lovely as good stew with fresh bread. I will end with a note about the choggia beetroot that I bought at Coburg Farmers Market. I had hoped some of the stripes would show through in the final stew. 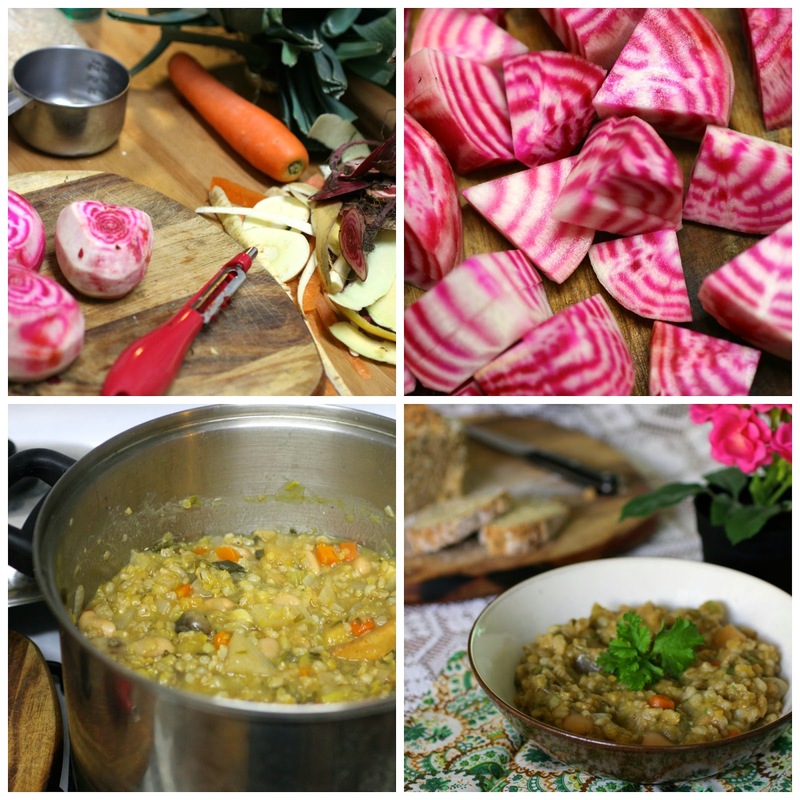 You can see in the photos that there is not a hint of beetroots pink hues. The beetroot stripes lost their colour and became the faintest of shadows. However I was pleased that E actually said how much he enjoyed the beetroot in the stew. I am sending this stew to Elizabeth's Kitchen for her Shop Local event that challenges bloggers to feature locally sourced ingredients. Heat oil over low heat in a stockpot and fry onion and garlic for a few minutes until translucent. 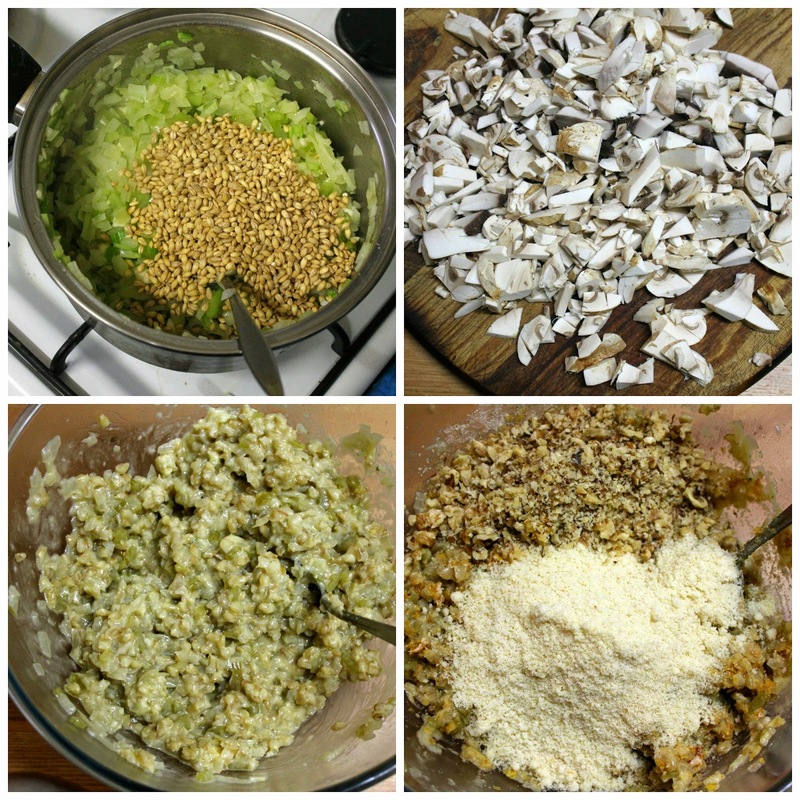 Add beer, water, barley, lentils, remaining vegies, stock powder, bay leaves, parsley, salt and thyme. Bring to the boil and simmer for about 40 minutes, stirring regularly. 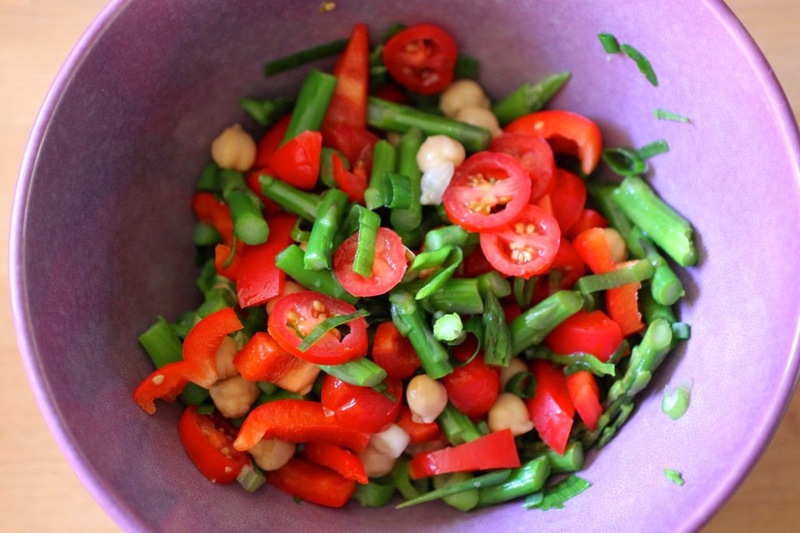 Add lima beans, vinegar, honey and black pepper. Cook for another 5 minutes until warmed through. Garnish with parsley. I mentioned that I was tired on Sunday morning. By that stage of the weekend I had already eaten out at the Grovedale Hotel and Federation Square, visited Newtown Farmers Market, looked over Treasury Buildings as part of Open House Melbourne, and viewed the lights at the Gertrude Street Projection Festival, as well as spending time in Geelong (out of town) with family. So here is a little more information of what I got up to. On Friday night we drove down to Geelong after Sylvia had finished school. We had a family birthday dinner at the Grovedale Hotel (236-236-258 Torquay Road, Grovedale tel: 03 5243 2814). It was my first visit but I think other family who live down that way have been there before. We were greeted with a huge urn of flowers and some fancy modern gates. 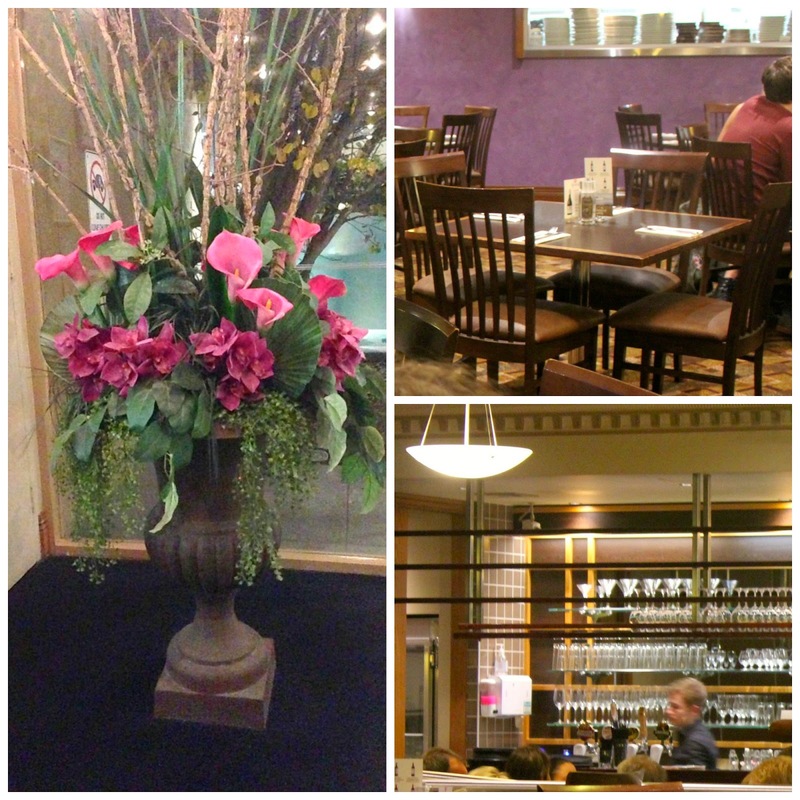 Portofino's restaurant is very modern and well lit with none of the clutter that you might associate with traditional pubs. At first glance I was not overly impressed by the menu which only had a vegie stack offered for vegetarians. 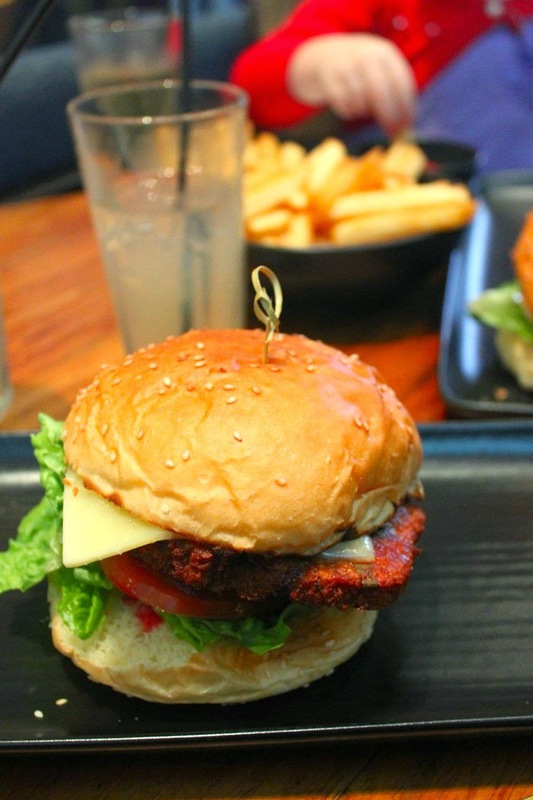 I have had too many bad vegie stacks to ever be enthused at the prospect. Then I saw there was a pumpkin gnocchi with basil and cashew pesto, ratatouille and roast tomato vinaigrette. 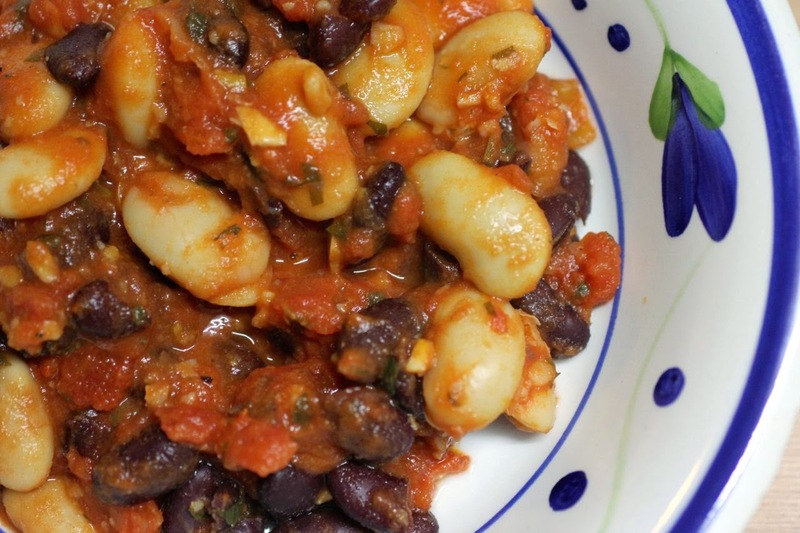 I was delighted to have a gnocchi that wasn't just rich and stodgy. 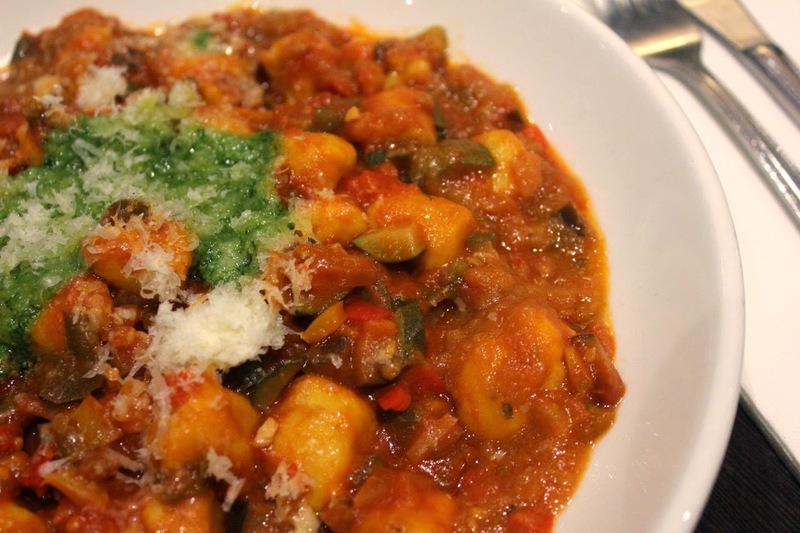 Packed with a generous amount of vegies, this gnocchi was very filling and full of flavour. The hotel catered well to children with a kid''s menu - as usual it doesn't really cater to vegetarian kids. Sylvia is happy with a bowl of chips (but I try to give her some decent food beforehand to balance out her meal). 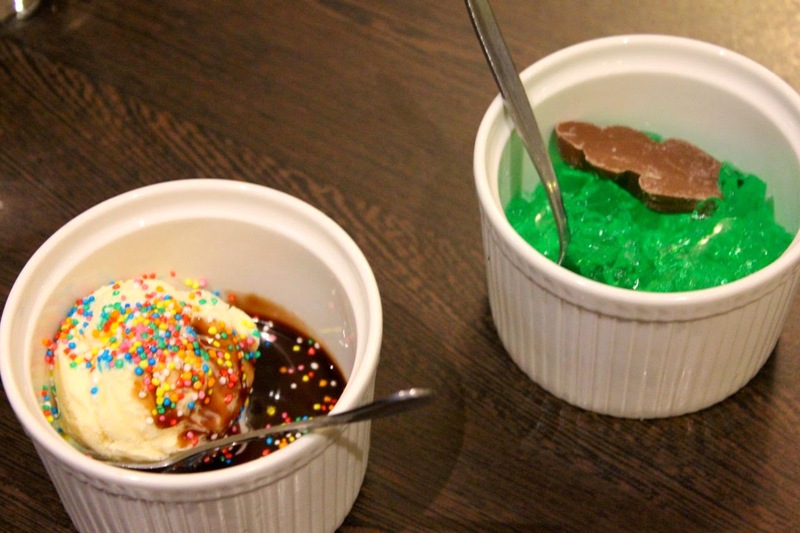 For dessert, she had the frog in a pond - a chocolate frog in a pond of green. I loved it when I was young just as much as she does now. I was impressed that although dessert orders were taken all at once, the kids' desserts arrived first. Generally the service was friendly and thoughtful. 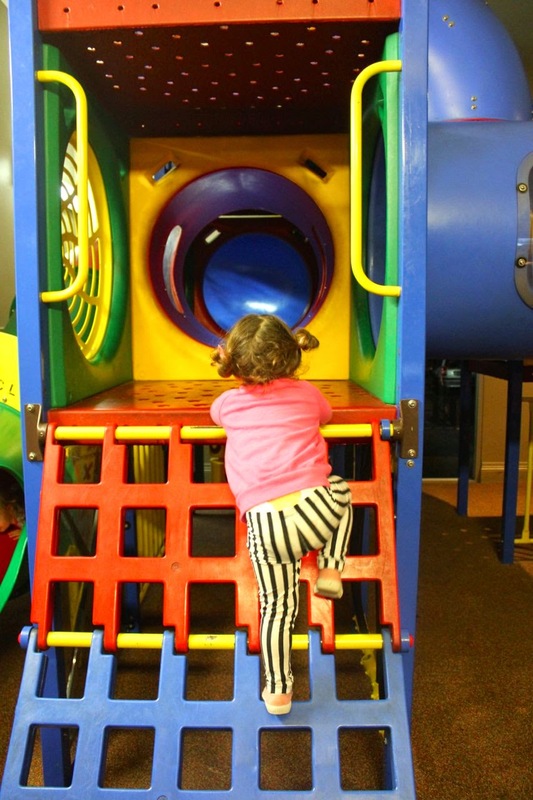 When not eating chips and chocolate frogs, Sylvia had a lovely time in the kids play area (see her cousin Stella at play in the top photo). The dessert menu presented a tyranny of choice. 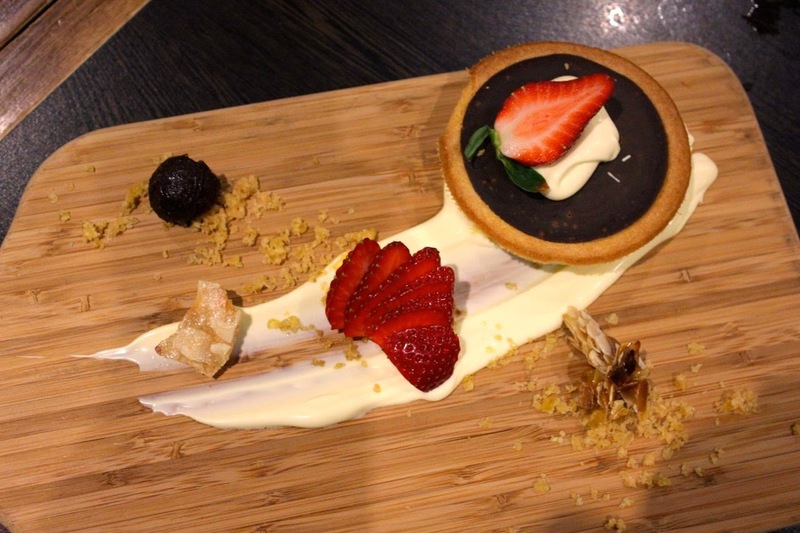 I ordered the chocolate and Baileys tart with double thick cream, almond brittle and fresh strawberries. It was good - beautifully presented - but I was not keen on it being served on a slick of cream. (I was the one in my family who never liked cream on any dessert!) I enjoyed the tart but would have liked it more gooey and less set. It was very rich - perfect for sharing. And share we did. I think I most loved my brother in law John's sticky date pudding because it was warm and sticky and soft and perfect for a winter evening. 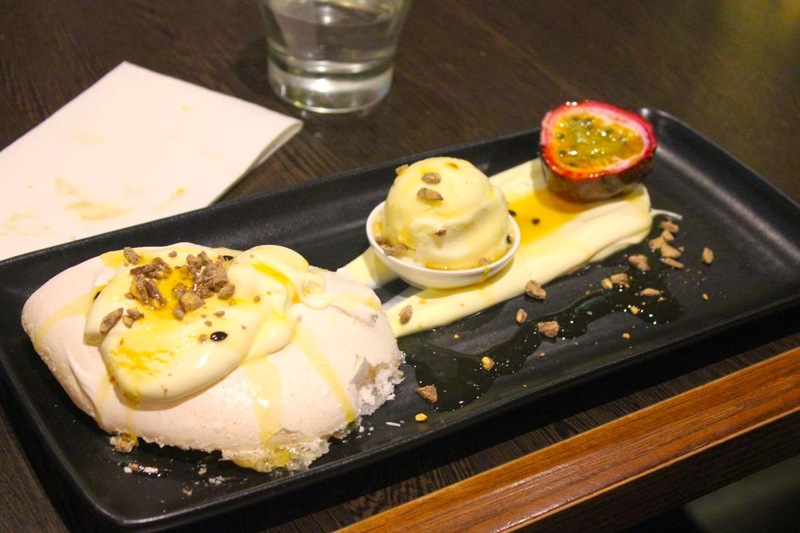 I also was very taken with the white chocolate and vanilla cheesecake with honey and macadamia sauce. My sister Susie had enjoyed it before because it is gluten free and loved it enough to recommend it and order it. It was indeed a marvellous soft creamy cheesecake but very sweet. 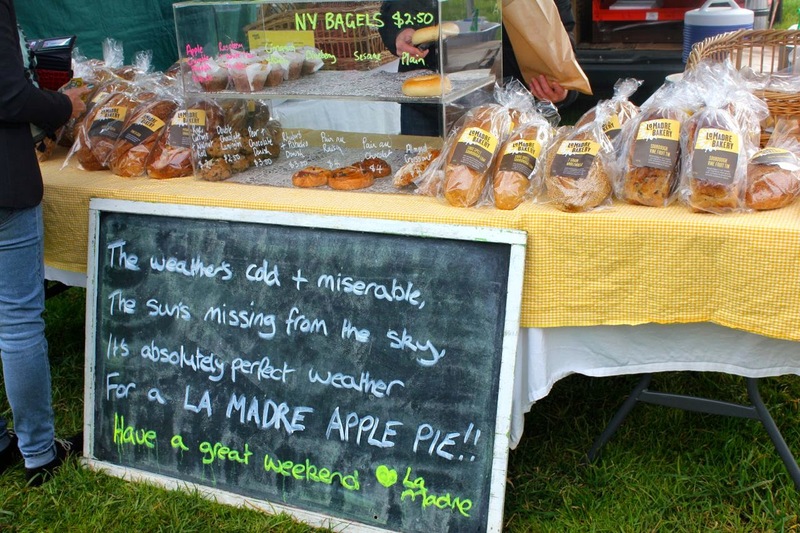 We stayed the night in Geelong and on Saturday morning, made a flying visit to the Newtown Farmers Market (on the corner of Shannon Avenue and West Fyan Rd). My mum and I just bought a few bits and pieces before she had to meet a friend for coffee. I headed back to my folks' place where Sylvia was playing with her cousin Ashy. It was very cute that they were doing drawings for each other. Ashy's big brother Cooper came over later and played hangman with me. My dad and I had planned to go to Melbourne for Open House and the light displays. 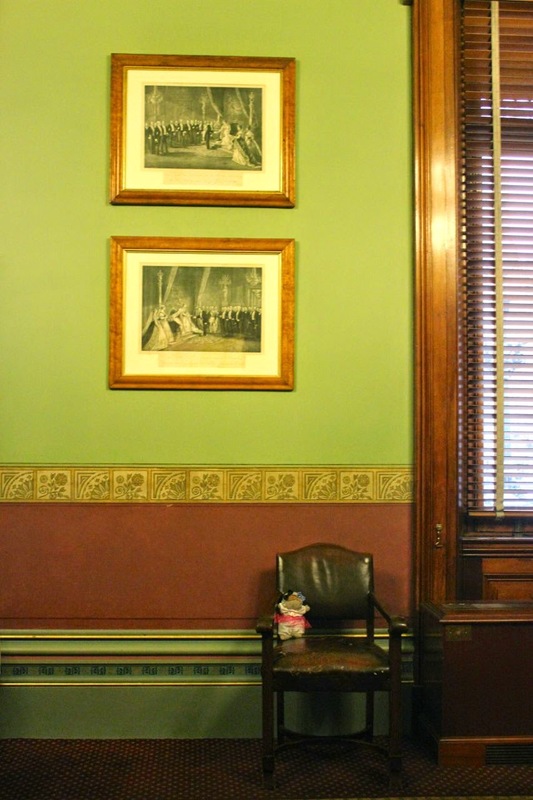 I have visited buildings for Open House Melbourne over the last two years. A few buildings seemed to have dropped off the list this year but there were still ones that interested me. 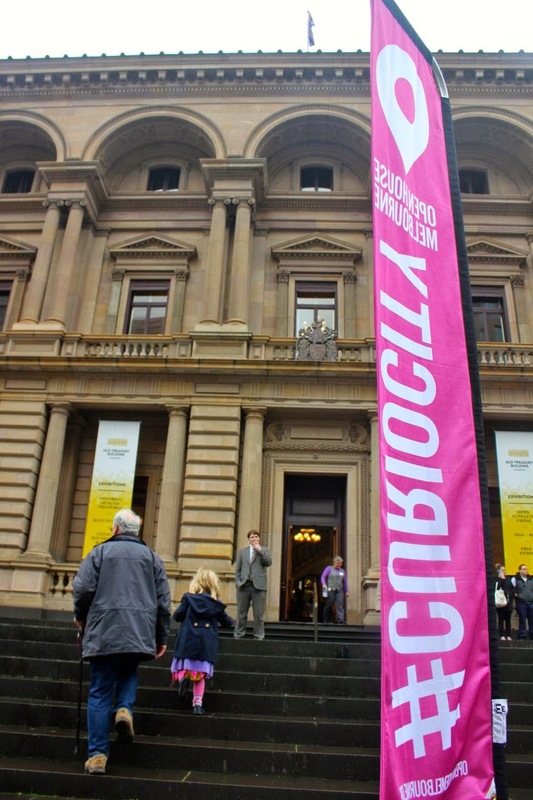 By the time we got back to the city, we were too late to queue anywhere and decided to go to the Old Treasury Building. I visited back in 2008 and enjoyed it enough to return. This imposing building was completed in 1862 to store gold from the gold rush. I don't remember it being quite so busy last time but I do remember the grandeur of the upstairs rooms and the simplicity of the caretaker's family's rooms downstairs. Sylvia plonked Dolly on a chair upstairs. My dad and I were amused to see people passing by with quizzical looks. 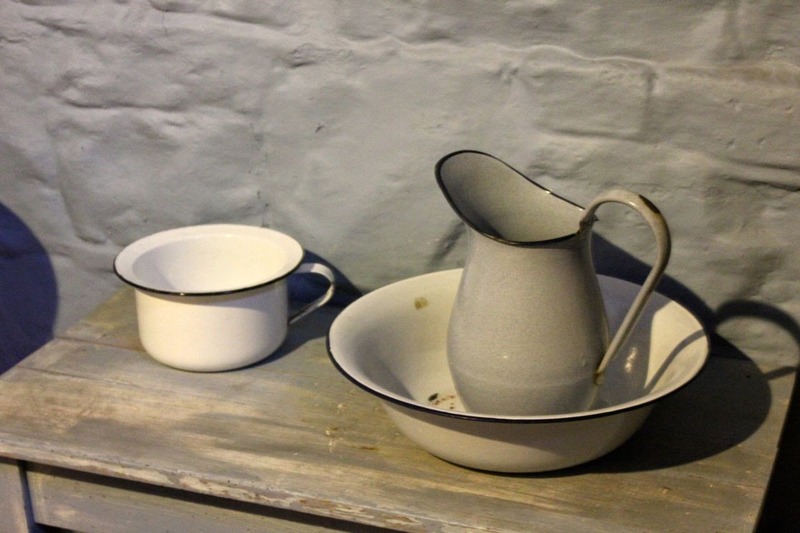 I particularly love the green cooker downstairs which you can see in my food history post. Possibly Sylvia's greatest curiosity was kept for the caretaker's section when she wanted to see a toilet. We pointed out the below pot. She was suitably amused. 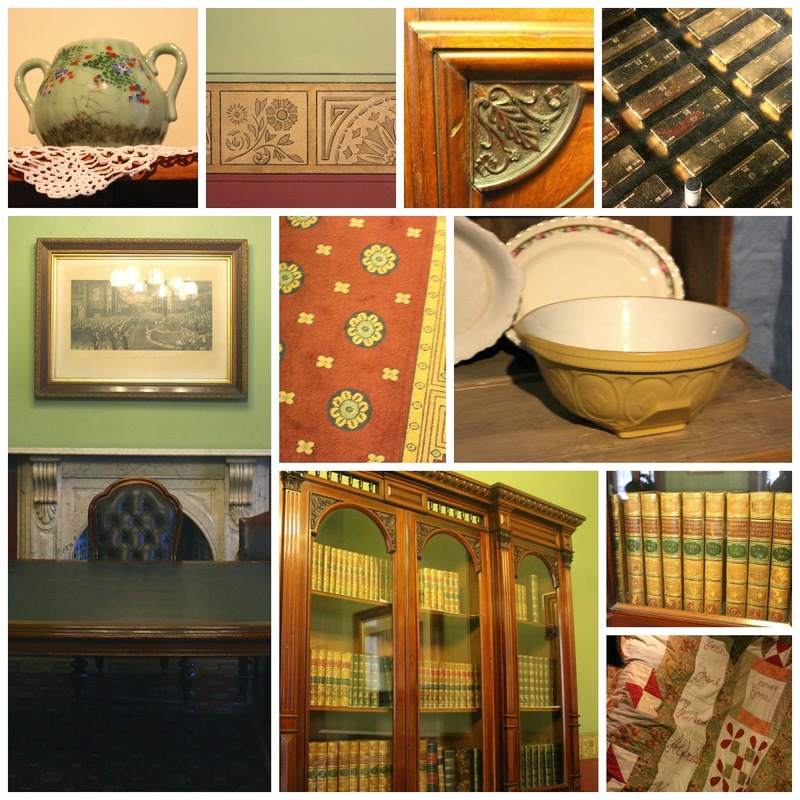 Both upstairs and downstairs also houses some interesting displays about Melbourne's history. It was so busy and Sylvia was thirsty so we didn't get much of a chance to stop and read. We did stand on the display of gold bars. (It has a glass floor over the gold!) The Old Treasury Building is regularly open as a museum. I must head back when it is quieter and I have more time. My dad and I were hoping to see the Paint the Town Red light display in the city. 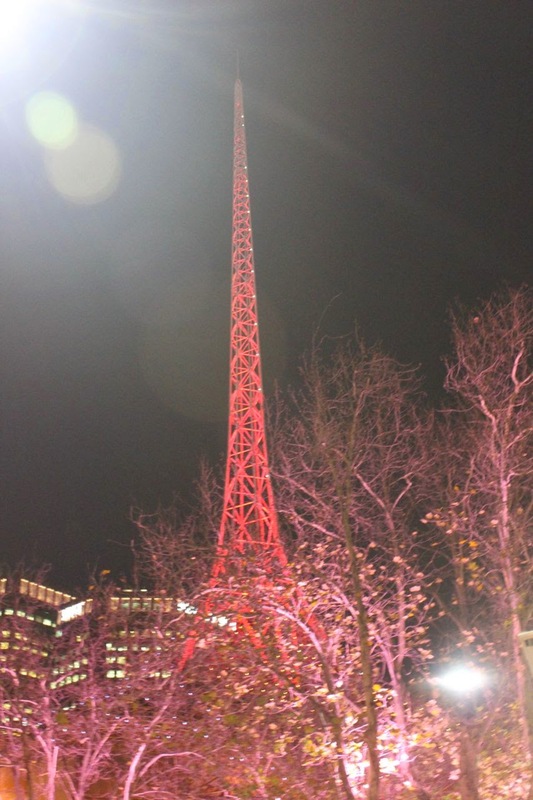 Apparently over 45 buildings are lit red at 6pm in a show of support during the international AIDS 2014 conference. This was our second journey into the city to see the lights and both times I was disappointed. The Arts Centre spire (above) was red but my dad and I couldn't work out if St Paul's Cathedral was lit red. Fed Square and the Town Hall definitely weren't red (though Town Hall was last weekend). Fortunately we had Sylvia with us and she just loved all the regular lights in the city. My dad left us then to get his train home. Sylvia found a shop selling ice creams which cheered her up no end! With an ice cream in hand (hurrah for cold weather preventing them melting too quickly) we drove to see the Gertrude Street Projection Festival. These were brilliant. 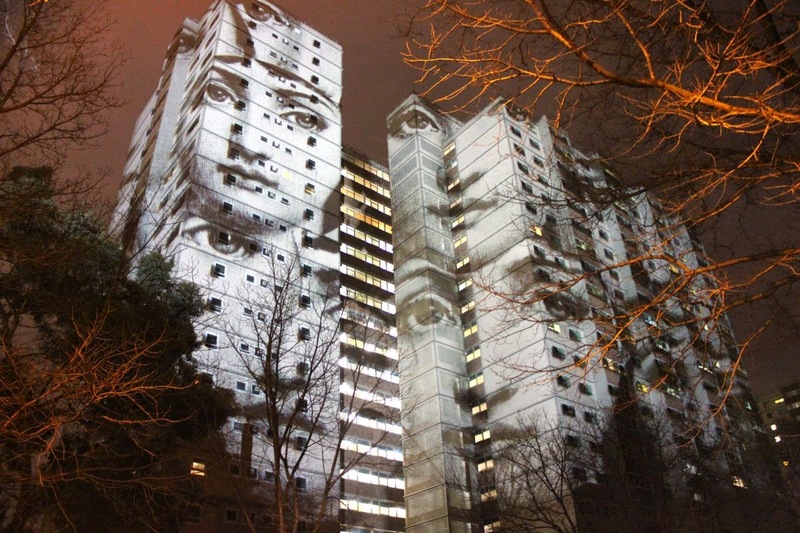 Different patterns and pictures were projected onto the Atherton high rise towers. Across the road a pub on the corner of Napier St was lit up with white fairy lights. We stood on the street corner watching the projections. The pub projections were actually interactive. A few people were using their phone to make little dots race about and chase the fairy lights. The miracles of modern technology! I really liked the friendly vibes of people standing around on the corner. I would have spent more time walking along Gertrude St and then back to the Wilde cafe at the corner of Napier St for a mulled wine but it was Sylvia's second late night and we had to get home. We drove home singing Frozen songs and feeling very tired. 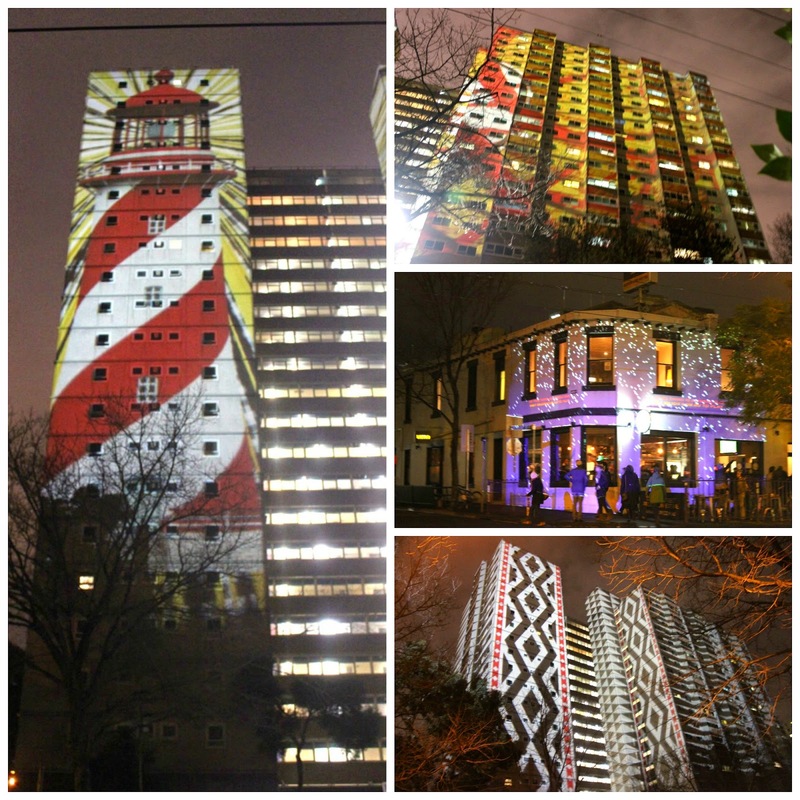 The projection festival has finished but there is information about other city projects in this article or check out the Melbourne Public Art Program. Grain free is the new gluten free. Once it was enough not to have gluten but now a lot of people follow a paleo diet. Not me. I am just a vegetarian with the right recipe at the right time. 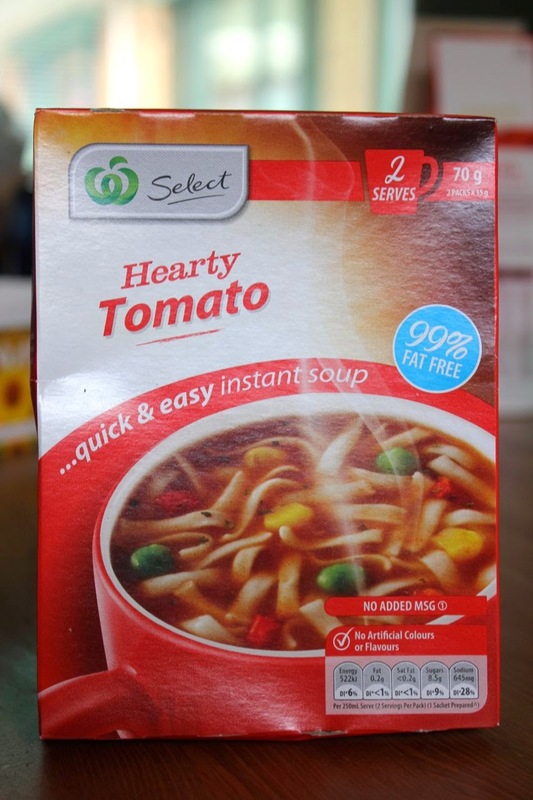 Vitasoy sent me Pete Evans' Healthy Every Day cookbook recently. 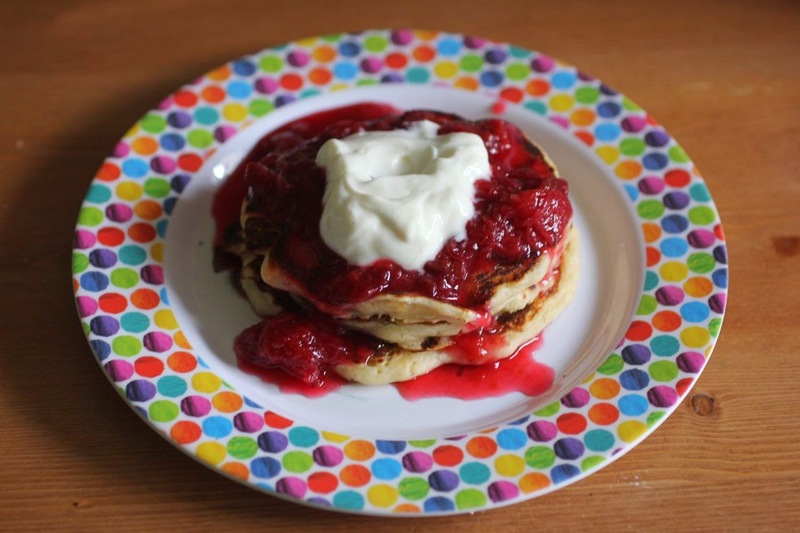 I have had my eye on the Almond and Berry pancakes for a while. This morning Sylvia wanted pancakes but there were no bananas for our usual pancakes. The moment had come. It has been a big weekend so I can vouch for these being fairly easy once I worked out what frothy eggs looked like. The recipe is not one I would make often as I rarely make anything with more than 3 eggs. And I am a bit unreasonably cross at the recipe because I was tired enough to drop my lovely salt hog while grabbing it for a pinch of salt. Argh! I cut a few corners in serving mine with plum and raspberry jam rather than berries and honey. As can be the case with gluten free baking, the pancakes were quite fragile when cooking. They firmed up as they cooled. They weren't at all fluffy like regular pancakes. The best way I can describe the texture is like a flourless orange and almond cake. Light and a little fragile when hot and quite sturdy when cooled. Sylvia was not a fan but E and I enjoyed them. The recipe suggested it would serve 2 but they were so dense that together we only got through almost 2 thirds. Even so I was not too fussed about lunch when I headed off to a school working bee in the late morning. I was still full from the pancakes. We finally had lunch at 2.30. I guess all the raking up the leaves finally caught up with me. 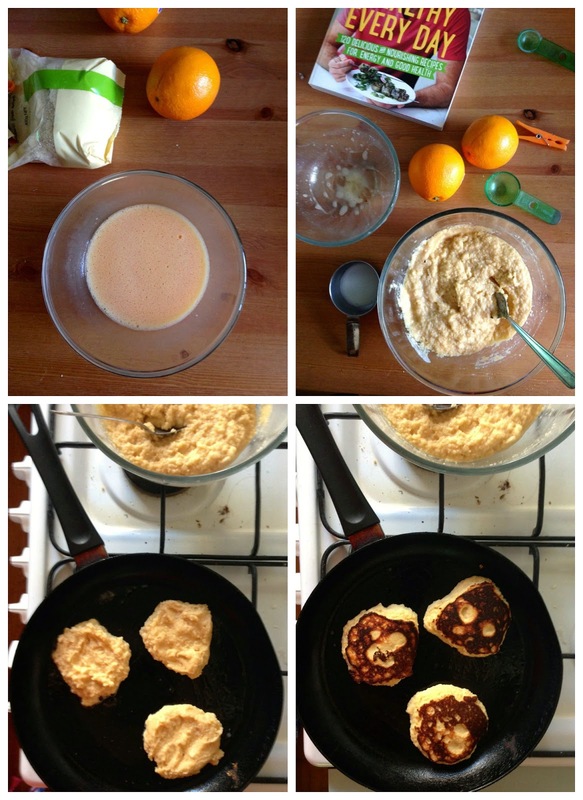 So while I can't see these pancakes being a regular, I would make them again, especially if we have gluten free guests for brunch. Whisk eggs in a medium bowl for a few minutes until frothy. Mix in milk and honey and give a good stir so that most of the honey dissolves. Place the dry ingredients in a medium mixing bowl and pour in the egg mixture. 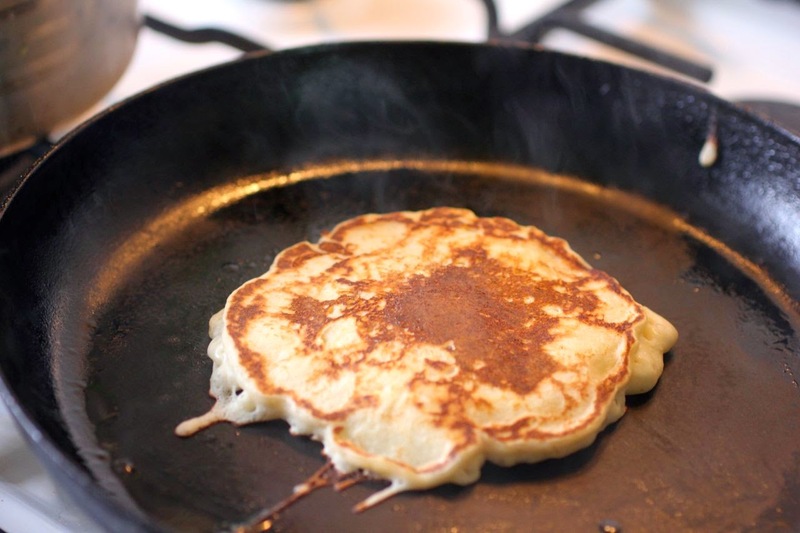 Stir to make a thick mixture (more like a loose paste than a regular pancake batter). Heat a heavy bottomed frypan over medium heat. Grease by rubbing about half a teaspoon of butter over the frypan (I used margarine). Drop dessertspoonfuls of mixture onto the pan and spread a little with the back of the spoon. Fry a few minutes until the mixture is a bit dry and when you check the other side it is golden brown. Fry on the other side about a minute. Eat warm with sweet topping of choice. I liked jam. E liked maple syrup. Or cool to room temperature and eat for snacks with jam or honey. Disclosure statement: I received the cookbook free of charge as part of a giveaway. All opinions are my own. Sylvia started it. I love to celebrate Christmas in July but had no plans this year. We had a quiet weekend at home to try and throw off our colds when Sylvia found the Christmas CDs and books. (Must hide better next time!) So began the craziness. I told her we could play carols and watch a Christmas DVD and I would make Christmas dinner. Why not when, baby, it's cold outside! For those unfamiliar with Christmas in July, it is truly delightful in Melbourne to celebrate Christmas in the middle of winter and indulge in a decadent festive meal. (Of course it is not about presents!) We are feeling very wintery lately. Sylvia is insisting on turning her calendar to August for the snowman picture. We even have had snow in the hills outside Melbourne. And I keep hearing wind and rain outside even when there is none. You see, I have had an ear infection for the past week that is playing havoc with my hearing. We needed a tree! I wasn't committed enough to drag out Christmas decorations. Instead we had a quick craft episode with a few rolls of colourful washi tape. 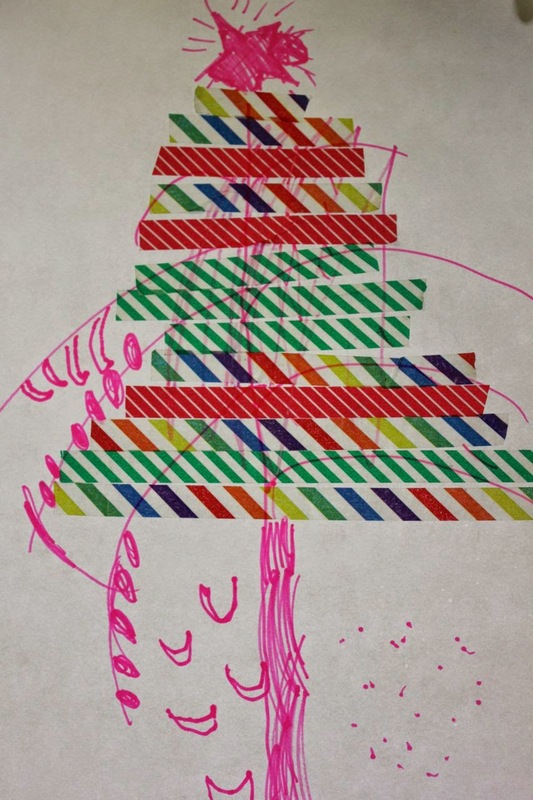 With a bit of guidance, Sylvia created a picture of a Christmas tree to put on the wall. Her tree had bananas and the star at the top was sticking out its tongue! 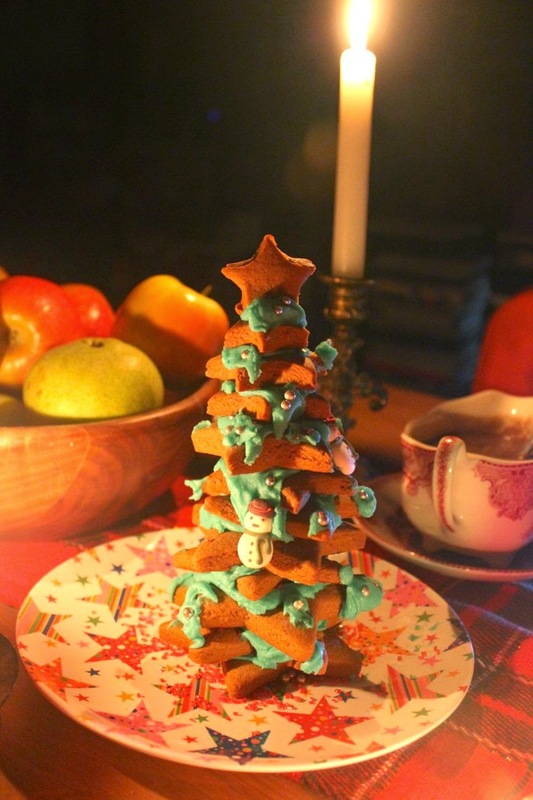 More effort on a Christmas tree was kept for our gingerbread tree. 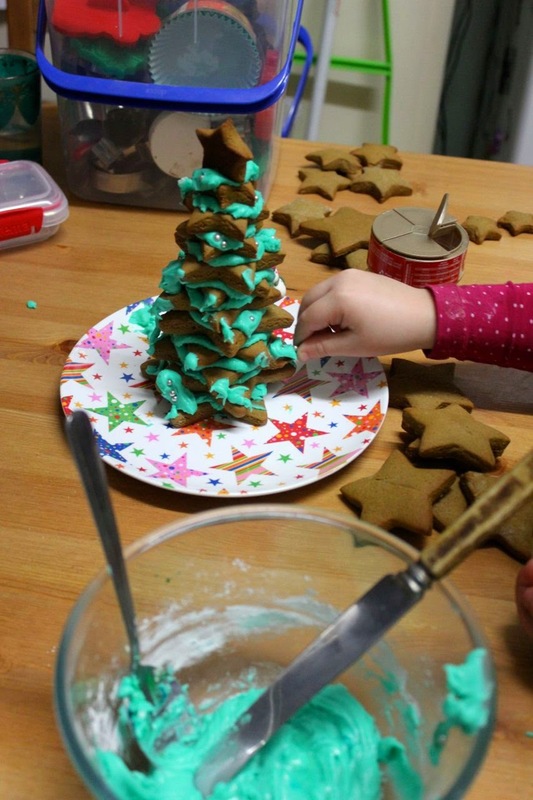 We have a graduated set of 5 star biscuit cutters that we have used on another gingerbread Christmas tree. Last time we used a gingerless gingerbread that was appropriate to our friend's intolerances. On the weekend we used my favourite gingerbread recipe. It has never let me down. We smooshed together the stars with green icing. Then Sylvia decorated it with Christmas sprinkles. I have decided my recipe is different enough to Jamie's to claim it as original because I made so many changes. The main one is that I couldn't find fresh cranberries to top the nut roast. They are rare in Melbourne at the best of times and I didn't have the energy to hunt them out. I only went to the shops because I needed another course of antibiotics. Our local shops don't sell wild mushrooms so I used portabello and button. I used whiskey instead of wine, smoked vintage cheese instead of cheddar, walnuts instead of pistachios. Even my breadcrumbs were different as I had kept leftover seasoned crumbs and cornflakes from some tofu nuggets. Jamie says to leave out the eggs and cheese to make the nut roast vegan. I would try mixing through a little tofu. 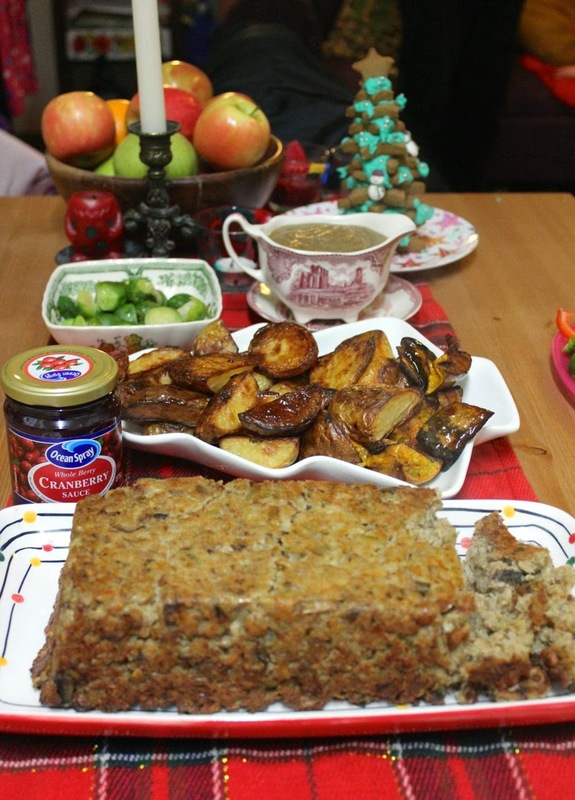 My nut roast took a lot of its flavour from the smoked vintage cheese. 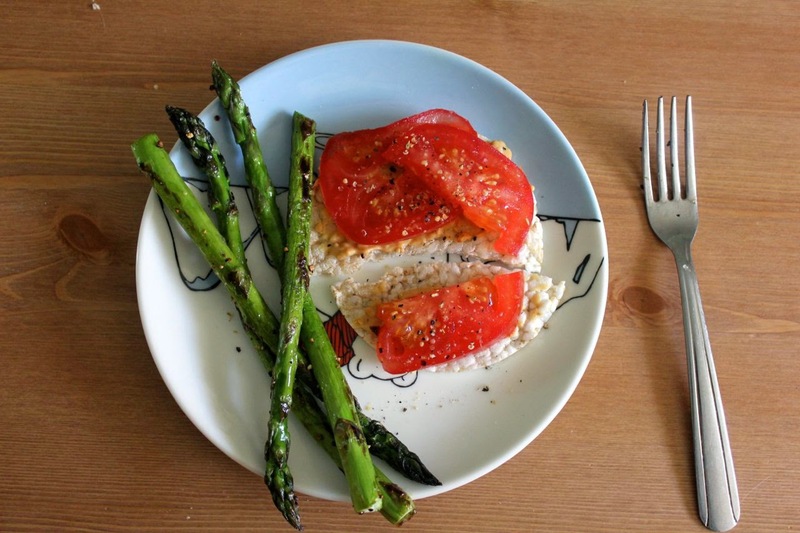 To veganise this nut roast, I would add some smoked paprika and additional seasonings. In fact the nut roast was so hearty that a small amount would suffice and it would serve quite a lot of people if need be. 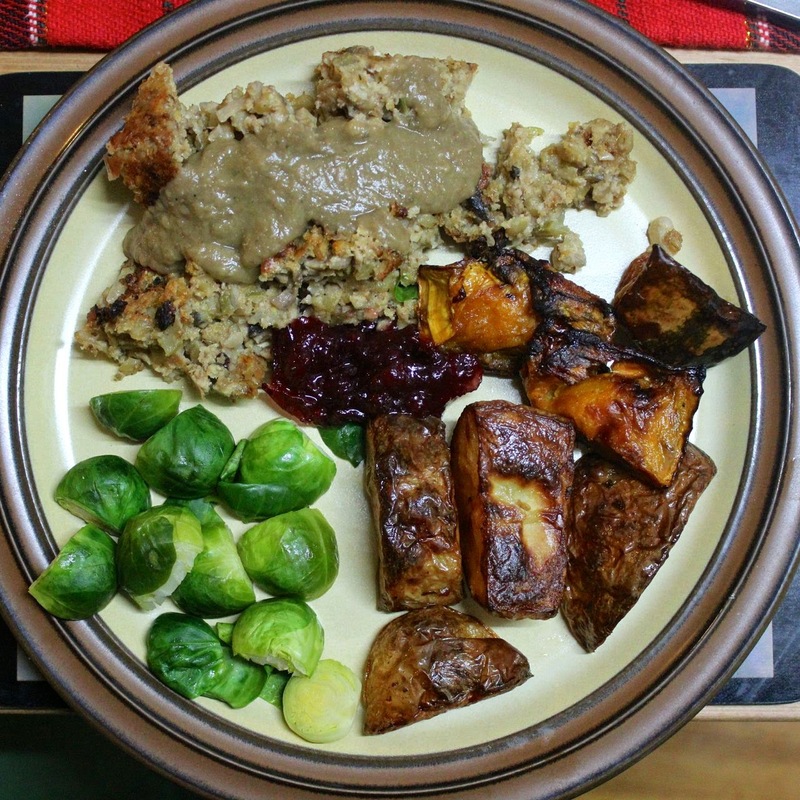 I had promised Sylvia a Christmas dinner so it was a proper roast dinner with roast potatoes and pumpkin, brussels sprouts, gravy and cranberry sauce. 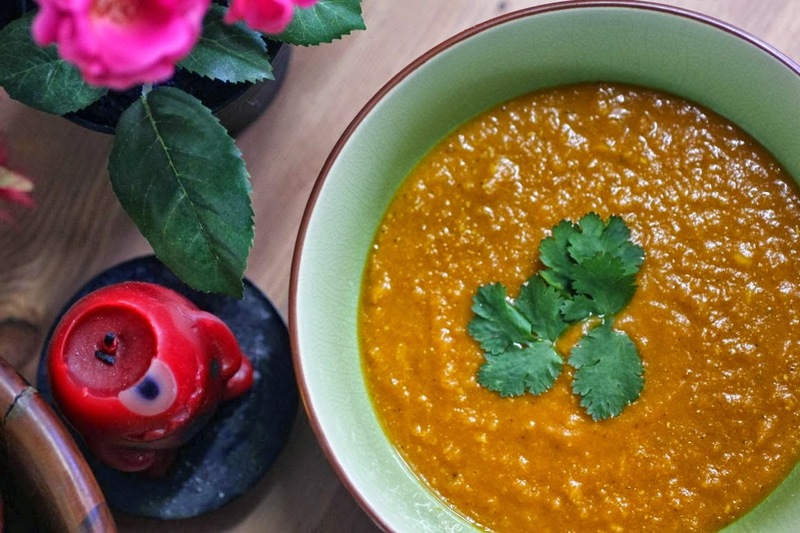 I had some miso lentil grave (from Isa Does It) in the freezer. It was ok but a bit thick and intense for a nut roast. The cranberry sauce worked well in lieu of freshly cooked cranberries. 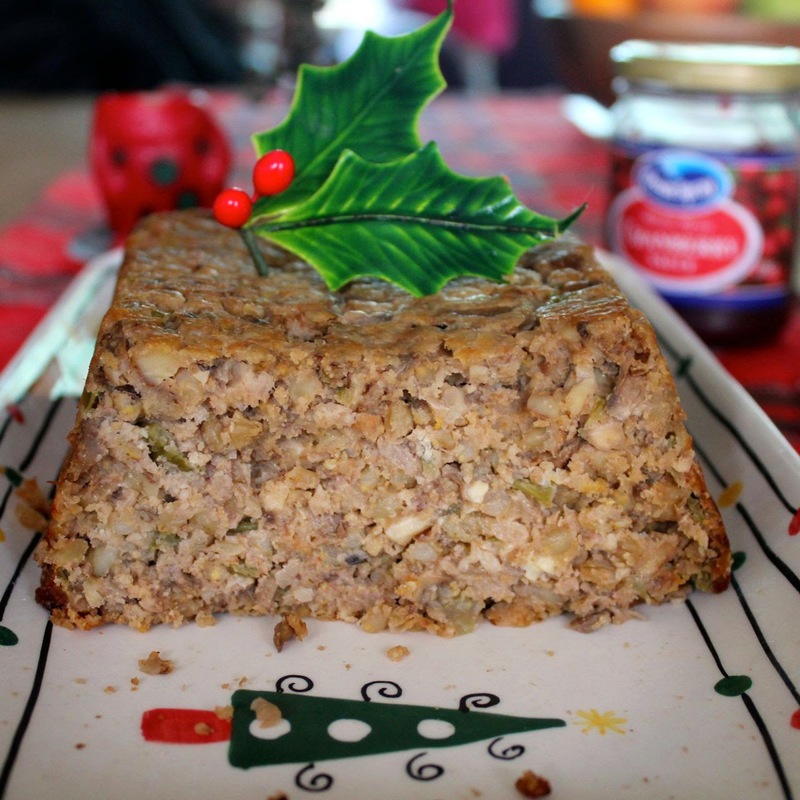 The nut roast was so flavoursome that it needed the sweetness to cut through the seasoning. And there were sprouts. There are always sprouts in a traditional British Christmas. I hated brussel sprouts as a child. E hated brussel sprouts when I met him. Yet both of us have come to love them. More surprising is that Sylvia loves them. She eats them first in her dinner because they are her favourite thing. When I ran out this week she was demanding that I buy her more sprouts. Am I alone in thinking this is odd behaviour in a child! Not that am complaining. Even so, it seemed ironic that I didn't cook all the sprouts that I bought for the meal and wished I had. They were really good! I dug out our tartan table runner and Christmas dishes. Sylvia decided that dinner must be by candlelight. She loves roast potatoes but was less impressed by a small piece of nut roast. In fact the best thing she had to say for it was that if she ate enough cranberry sauce she couldn't taste the nut roast. 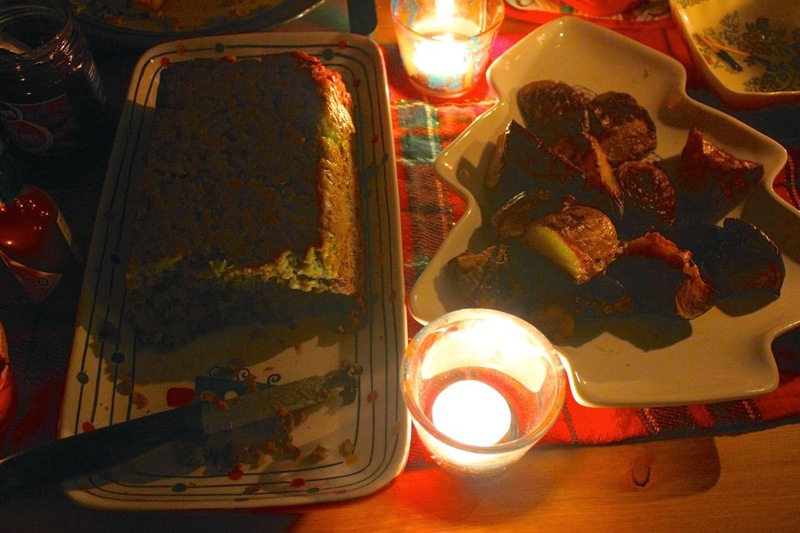 I suspect it was the candles and carols rather than the nut roast that made her exclaim that it was the best night ever. And Sylvia loved the gingerbread Christmas tree. She was very excited when it was time for dessert. This was an easy and yet impressive way to finish our Christmas dinner. And it made a festive touch to the table. I enjoyed the gingerbread but I was so full from main course that it was a bit wasted on me. As a meat eater I once loved the leftover meat after Christmas dinner, and as a vegetarian I now love the leftover nut roast. The following day we had plenty of nut roast. Did I mention that I baked oat and seed sourdough bread around preparing for our Christmas in July! 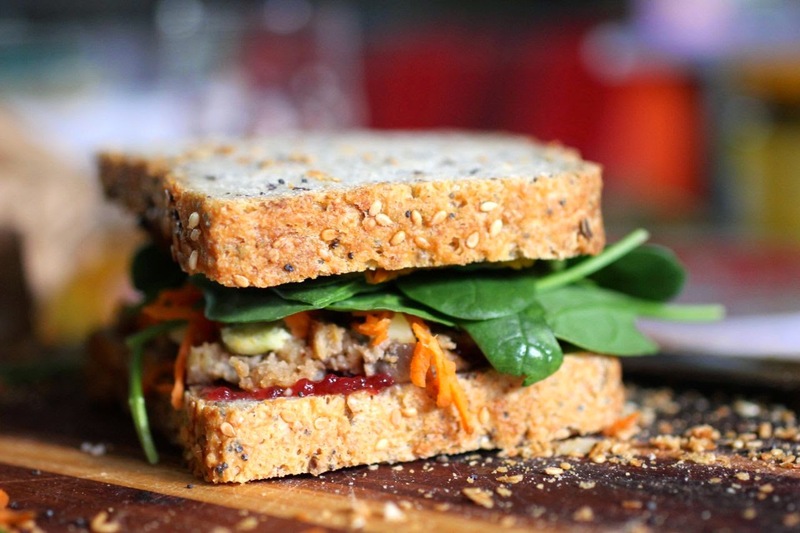 It meant that I could eat wonderful leftover nut roast sandwiches. Actually I overdid the cranberry sauce and roasted pumpkin in the sandwich. It need a little less sweet flavours but with spinach and grated carrot was still lovely. I also made some rice and nut roast, a bit like this recipe (without stuffing it in peppers). And the next day I could photograph the nut roast in daylight. Natural light for blog photograph seems very limited at the time of year. For those in the Northern Hemisphere experiencing long summer days (or as The Age newspaper recently said, Britons experiencing a (sort of) heatwave), you probably don't feel very Christmassy at all. Perhaps reading this post, you are feeling just the way that we do Down Under when it comes to Christmas in December: too hot to think about Christmas and finding it hard to feel in synch with those wintery weather that are the hallmark of the festivities. For us, it felt just like right. But even better without the annoying commercialism. This is the sort of Christmas I wish for all year round! Anyone Can Cook Vegetarian Food at Cate's Cates, where the theme is Christmas in July this month. 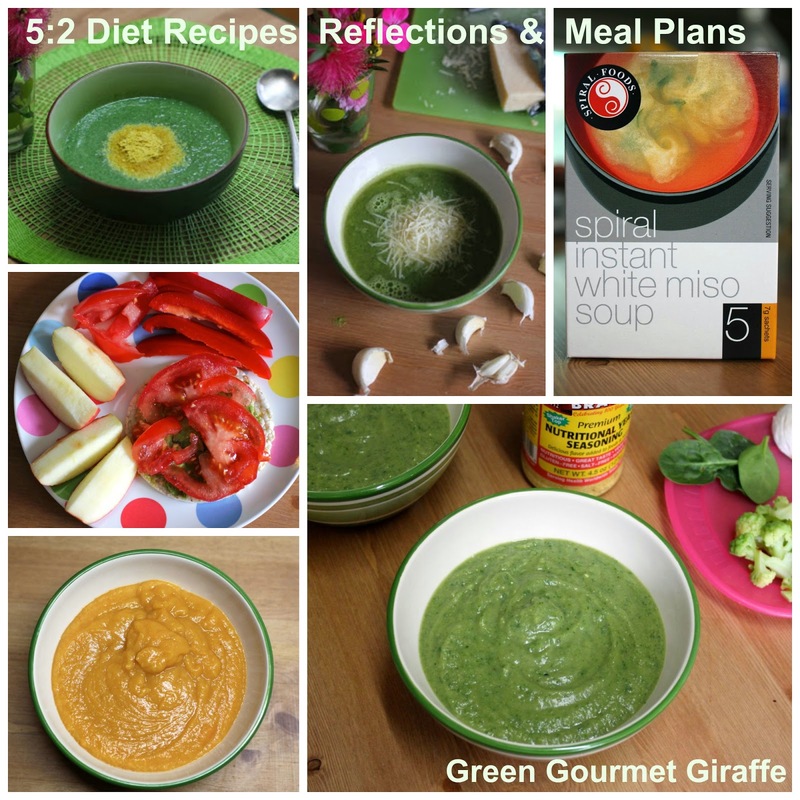 Recipe of the Week at A Mummy Too. 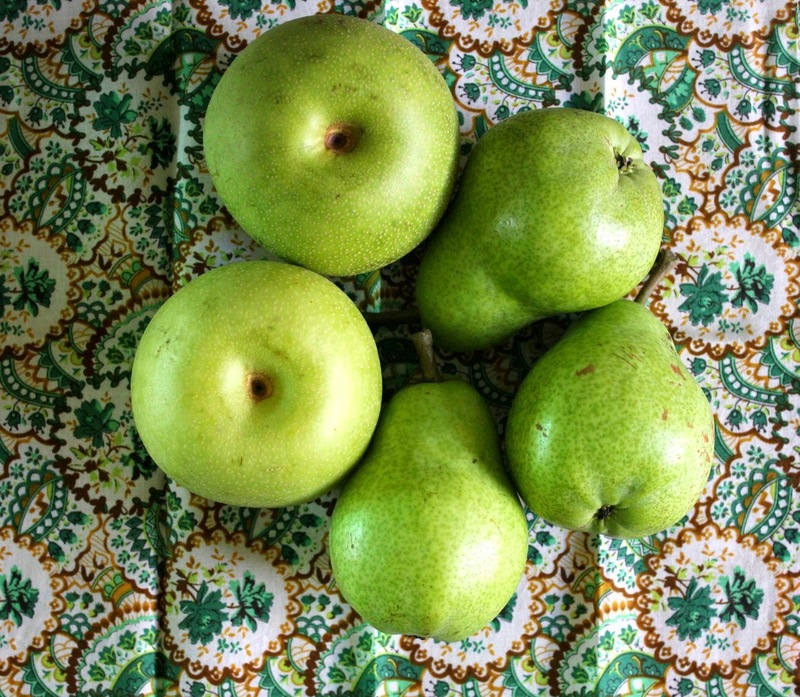 No Waste Food Challenge - hosted by Anne's Kitchen and coordinated by Elizabeth's Kitchen Diary. Extra Veg blog challenge hosted by Juggle Mum, which is coordinated by Michelle at Utterly Scrummy Food for Families and Helen at Fuss Free Flavours. Heat between 1 and 2 tablespoons of oil in a medium saucepan. Fry celery and onions over medium heat for 10 to 15 minutes until soft. Stir in garlic for a minute or so. Add pearl barley and fry for another 5 to 10 minutes. 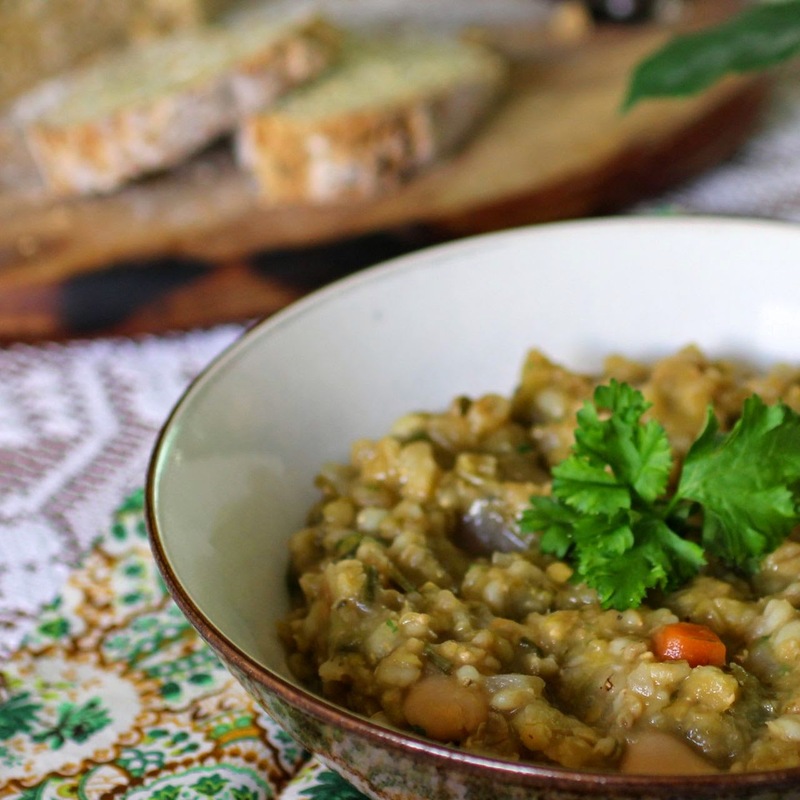 While the barley and mushrooms are cooking, prepare remaining ingredients and add to a large mixing bowl. Add pearl barley mixture and mushrooms once cooked and stir together until well mixed. Spoon mixture into the prepared loaf tin. Smooth the top of it with the back of a spoon. Bake for about 1 hour and 15 minutes. Turn halfway through the baking and check if it needs to be covered in foil. My oven refuses to burn anything (except the odd chip) but I know others are more powerful. I baked mine for 40 minutes at 200 C and it was a bit soft so longer would be better. Allow to rest for at least 10 to 15 minutes. Turn out onto a serving tray. You can make this a day ahead and keep on a serving tray covered in foil (once cooled) and reheat (covered in foil) on the day. Serve with lots of roast vegies, greens and gravy or anyway you want. I highly recommend some cranberry sauce. 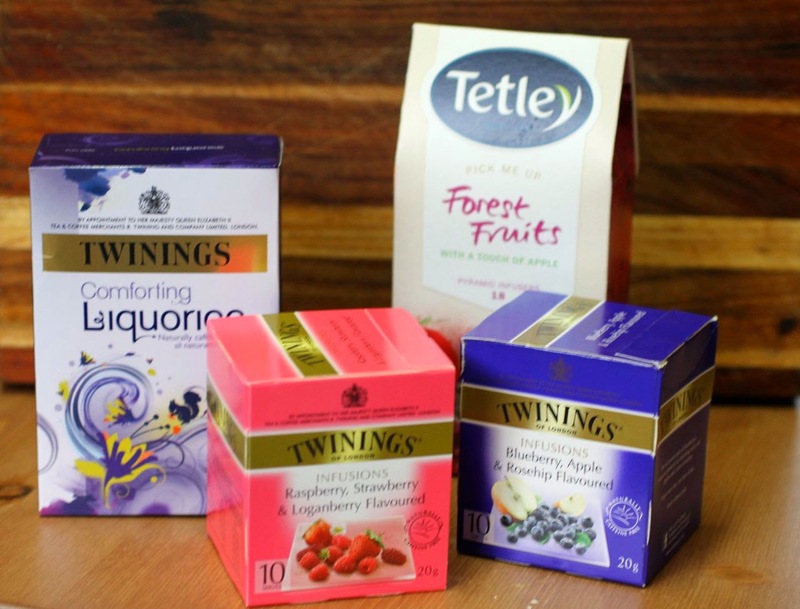 When I started blogging back in 2007 I was having a lovely time experimenting with new flavours and ideas. It was only later I realised that I had forgotten to include the basics. I just took them for granted. Perhaps that is why I have posted a recipe for dark chocolate and cranberry shorrtbread and spiced chocolate shortbread but until today I have not posted a basic shortbread recipe. It might also be that I find regular shortbread to be quite dull. Maybe it was not always so. I blame my current disdain for shortbread on the months I spent working in a quiet office in Edinburgh. Most of my days there were spent gossiping and raiding the stocks of Walkers shortbread. However, I live with E who loves it with a passion that betrays his Scottish upbringing. Our little girl loves shortbread too. The cookbook is full of traditional recipes. Most of the dinner recipes are meat. I have spent more time looking at the baking chapters. It is written for women who are skilled in the art of baking and don't need precision when it comes to cake tins, amounts of ingredients or baking times. I consider myself a competent cook and yet I find this sort of recipe challenging. I have tried the treacle scones once or twice and not got the (unspecified) amount of milk right. 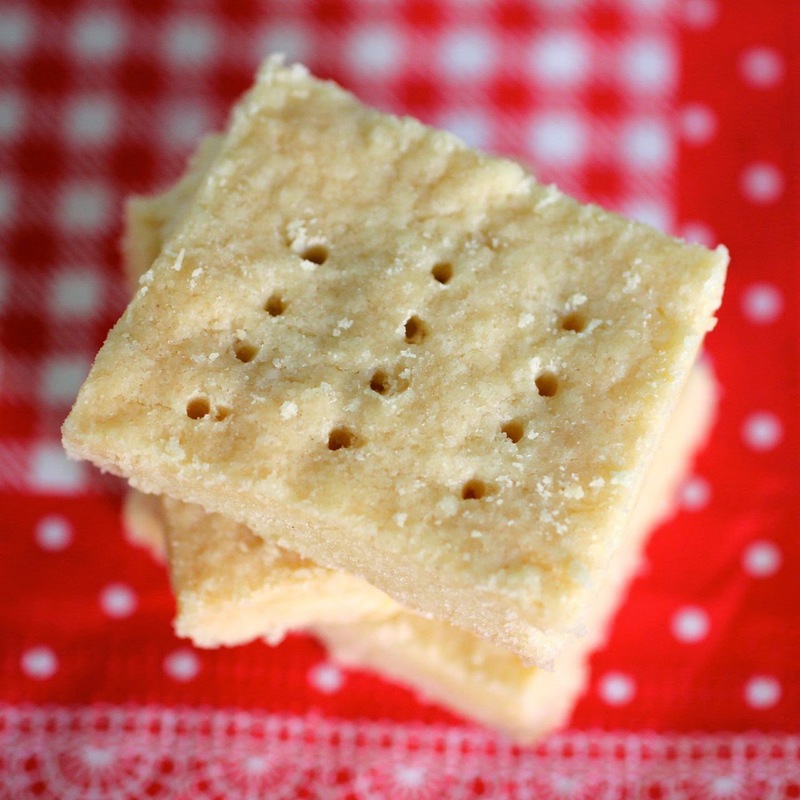 Earlier this year I tried Ena Baxter's shortbread. The recipe didn't give a size of tin or nor the time to bake it. I had to try it twice to feel like I had it right. The first time I didn't fill the whole of the lamington tin because it seemed too thin. The shortbread was golden brown around the edges but in the middle it was too pale, dense and soft rather than sandy and crumbly. Don't get me wrong. It was edible. Which was just as well. 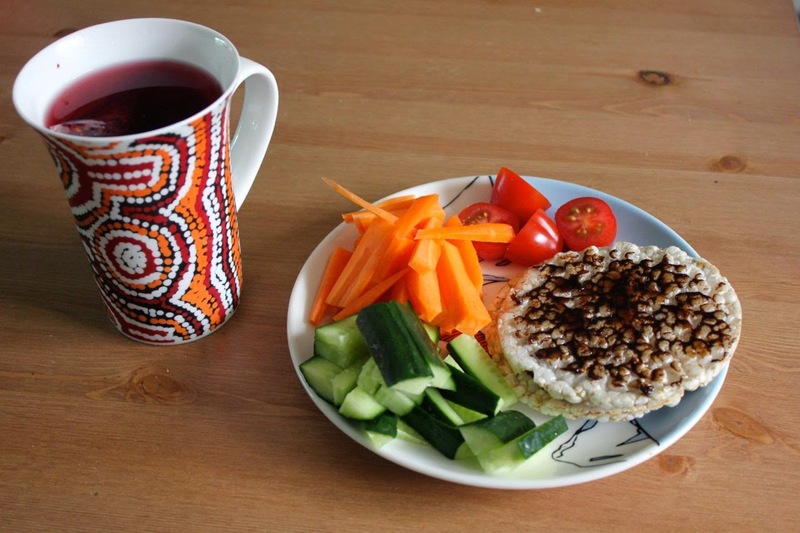 I had made it for a school lunch on Harmony Day. This is a day for children to wear their national dress and bring food from their family's country. Sylvia wore a tartan skirt and a t-shirt with the Scottish saltire on it. I had to pin them to fit with a safety pin or two. 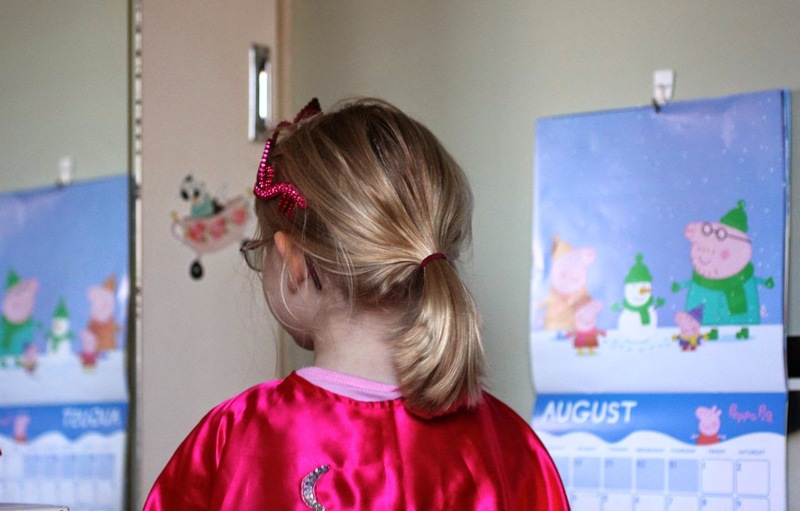 It surprised me that Sylvia did not know what a safety pin was. I grew up helping changing my siblings' cloth nappies that were held together with safety pins. I guess they just don't feel safe enough for kids any more. Well I guess I did stick the safety pin into them occasionally. Oops! Incidentally I was quite surprised at an article in The Age newspaper on racism damaging children recently which said that one-off multicultural events "can do more harm than good and reinforce rather than challenge negative attitudes and beliefs". I wonder how this plays out at Sylvia's school where there is a lot of diversity in the children's backgrounds. Today I heard about a nutrition presentation at the school where a child asked if the puppet presenter was fasting for Ramadan. But I digress. Back to the shortbread. I tried again. This time I spread it thinner, cooked it until I knew the colour seemed more evenly golden brown. It was much better. Cooked right through. Sandy and crumble. Sylvia had been a bit wary about the first batch but gobbled up the second. And I think Ena would have been pleased that I am learning not just by cookbooks but also by learning from doing. 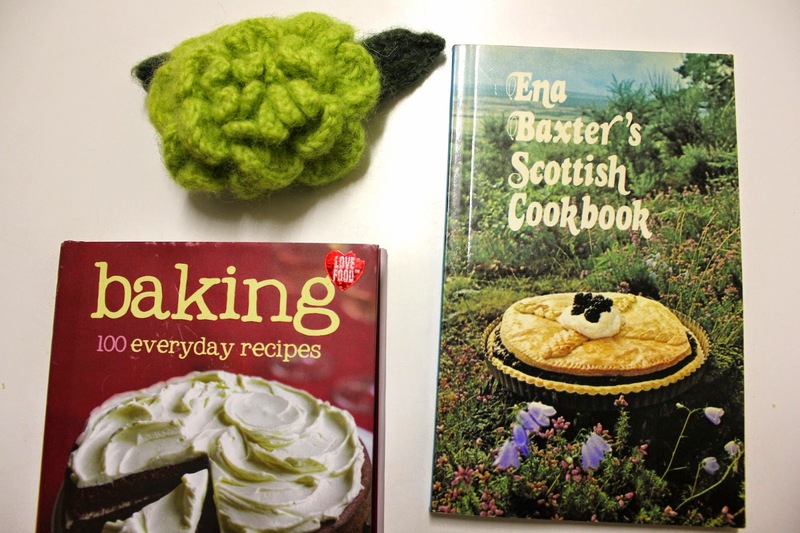 E's mother would also be delighted that I am using her cookbook to feed her son and granddaughter (and myself) a traditional biscuit that has been eaten for many generations in Scotland. 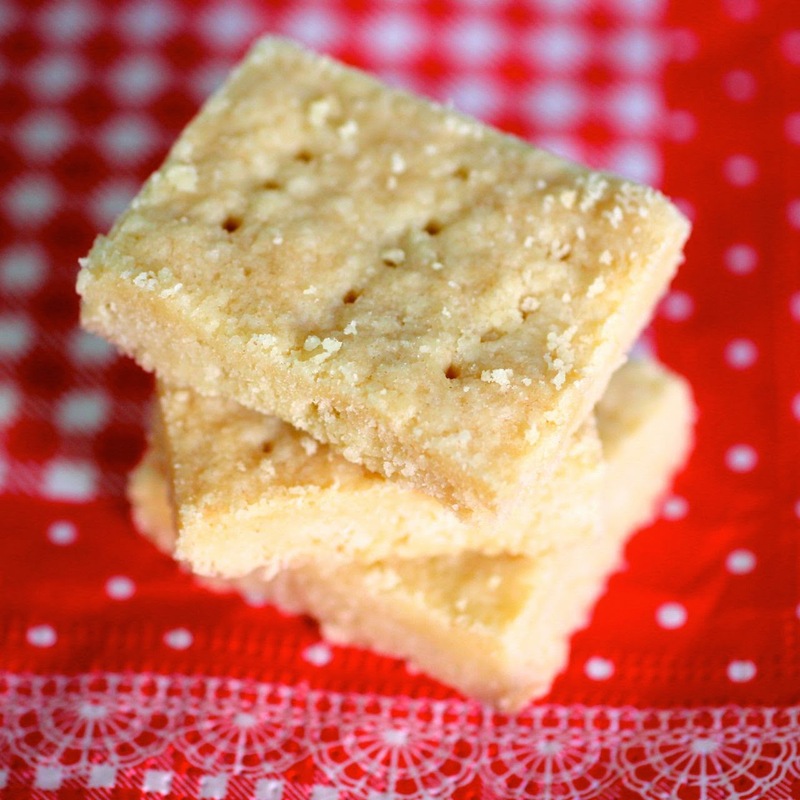 So while plain old shortbread is not my favourite thing to eat, it is embedded in our family and can make me feel quite sentimental Which is a good reminder of why the simple foods are sometimes the most important to us. I am sending this to Cates Cates for the Christmas in July theme this month for Anyone Can Cook Vegetarian Food. 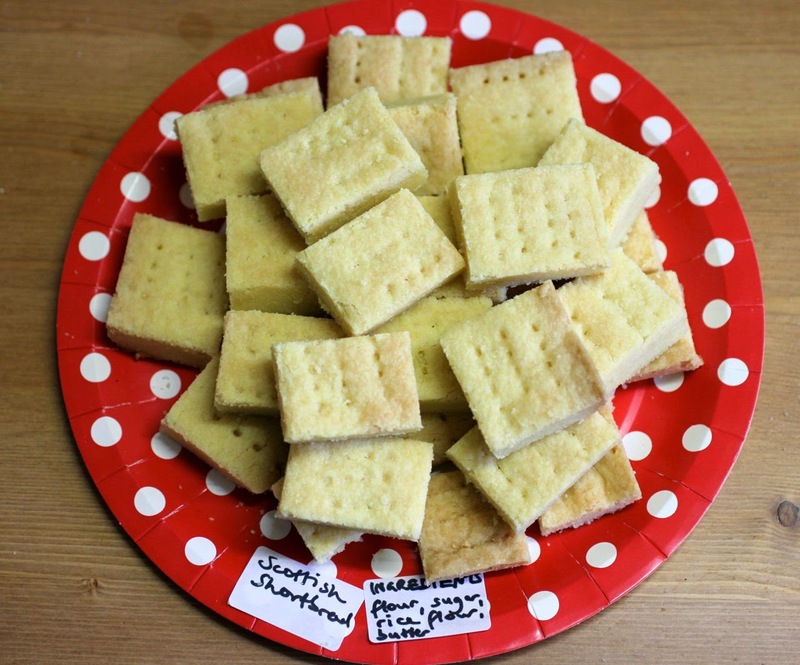 While shortbread can be enjoyed all year round, it is also a traditional festive treat and great for gifts..
Preheat oven to 160 C or 325 F. Line a lamington or swiss roll tray with baking paper (mine is 31 x 24cm). Use your hands (or pastry cutters) to rub butter into flours and sugar until thoroughly incorporated. The mixture will be soft lumps. 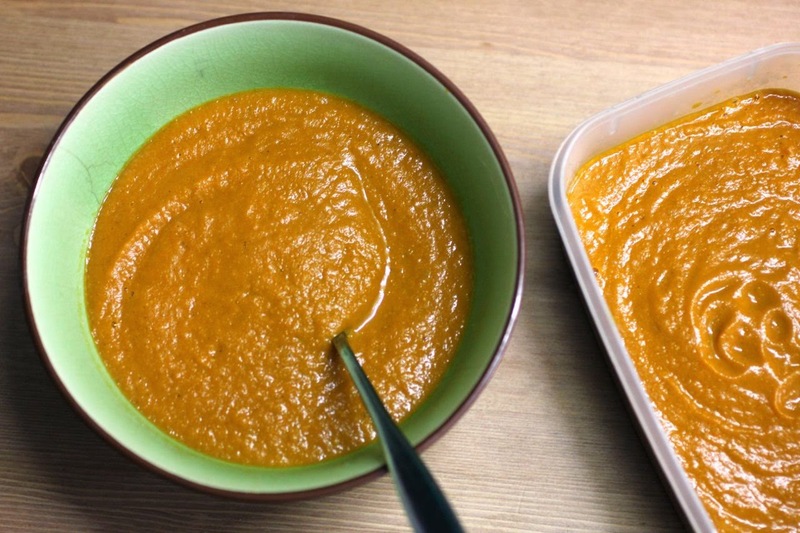 Tip the mixture into into the prepared tray and use the back of a spoon or your hands to press it down firmly, evenly and flat. It might seem thin but thin is good. 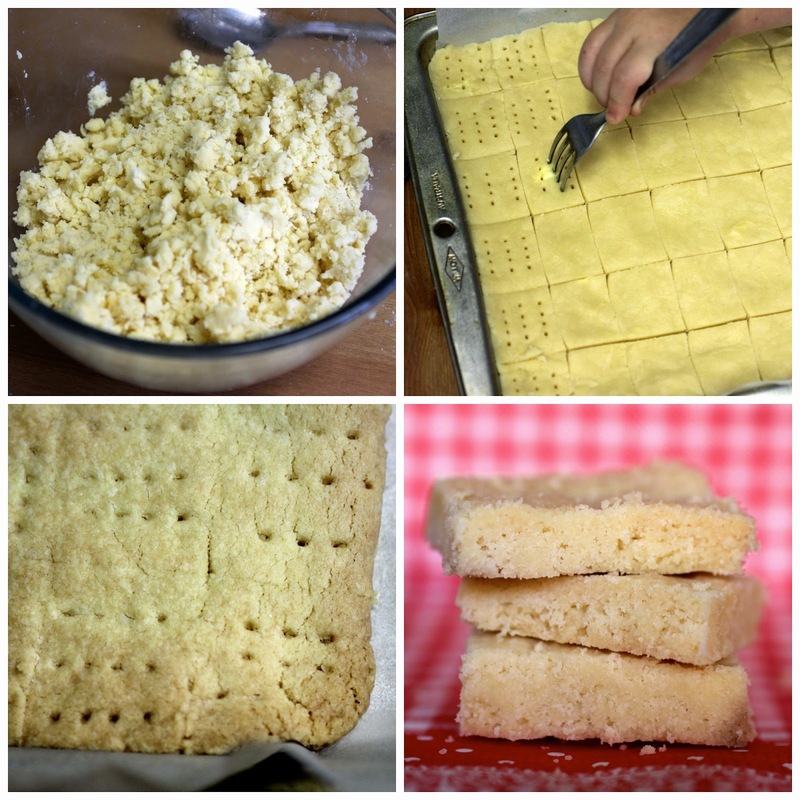 Mark squares (or fingers) by running a knife through the shortbread dough. Use a fork to poke holes in each piece. Bake for 30 to 40 minutes until golden brown. Cool in the tray and then cut into squares or fingers as marked. It was a cool autumn morning with a banana to use up. 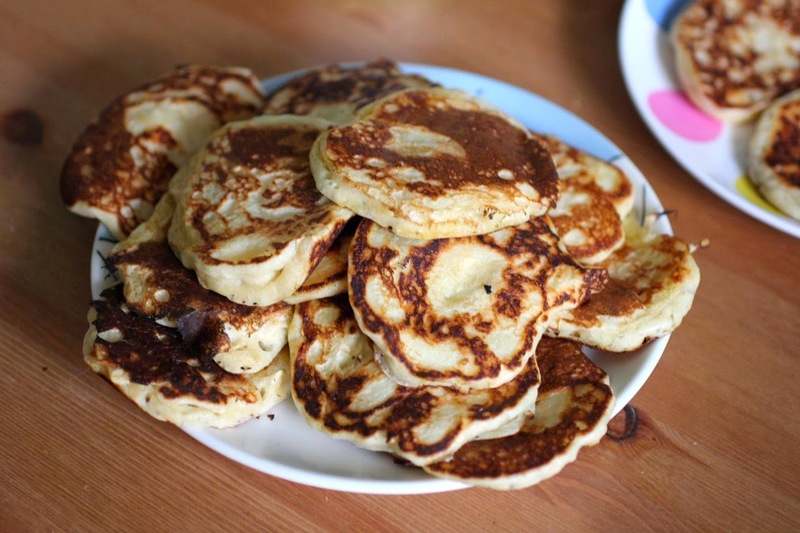 That calls for banana oat pancakes. This is my easy way of using up smelly old bananas and pleasing Sylvia. I hadn't been baking much sourdough bread. I don't like to discard the starter so I just feed it up and find a purpose. Usually that is flatbreads. I thought I would try tossing it into the pancakes. Most of the pancakes were small but I made a large one at the end when I had had enough of frying. 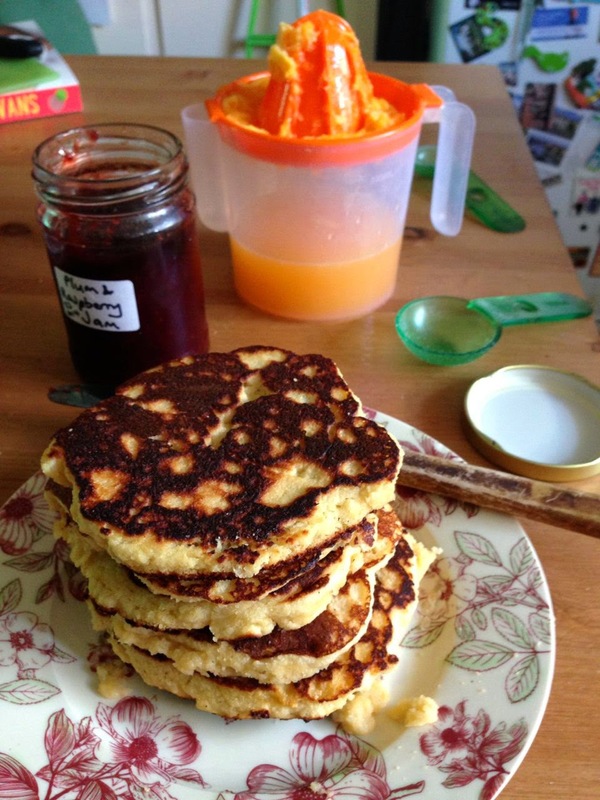 However, they fried quite quickly and soon we had a plate piled with pancakes. They were a bit flatter than my usual version and also not overly sweet. I had stewed some plums the night before. This meant the pancakes were fancier than the usual lemon and sugar or maple syrup. 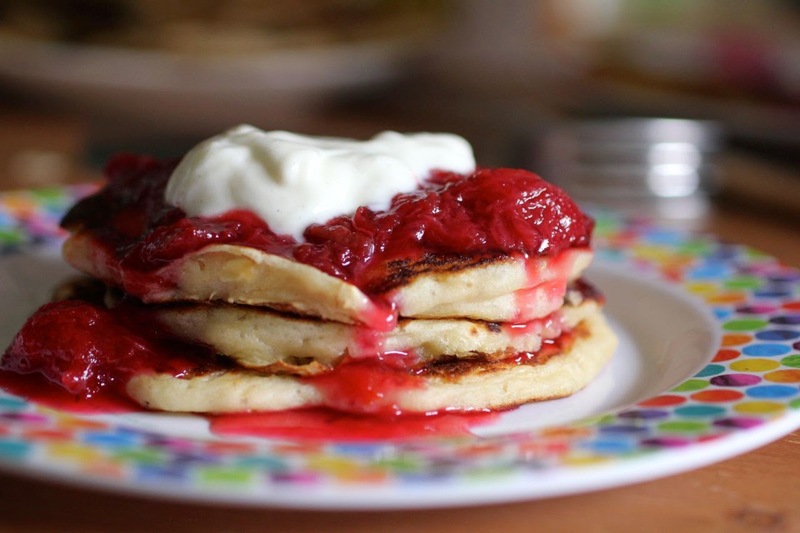 I had a pile of three pancakes with plums and vanilla yoghurt. It was scrumptious. Then I had seconds. And was very full. Now we were ready for the day. Heat a frypan over medium heat. Melt a little butter (about 1/2 tsp) in the frypan and use the back of a spoon to spread it about evenly. Drop dessertspoons of batter into the frypan. 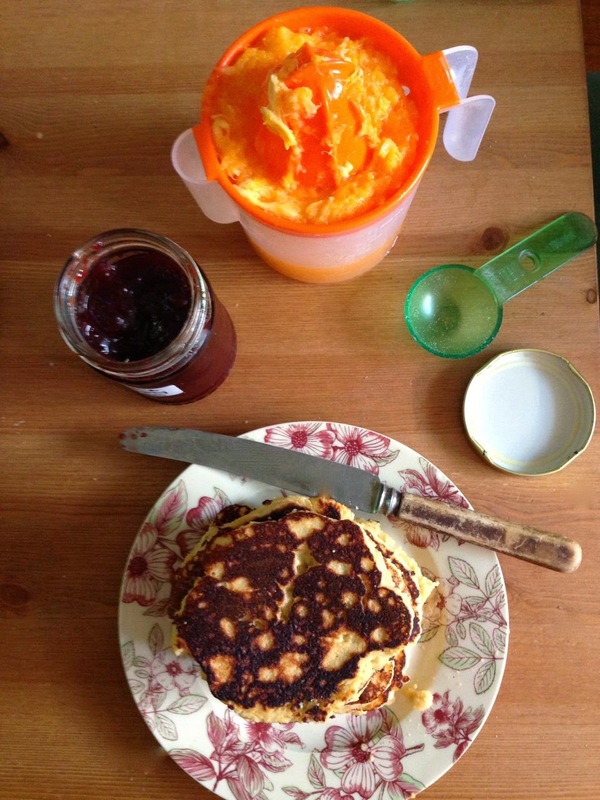 (Or two spoonfuls for a slightly bigger pancake.) Fry a few minutes until bubbles appear. Flip over and fry another minute or two until the other side is golden brown. Serve warm with your choice of toppings.